The Excitement of the Rivers! 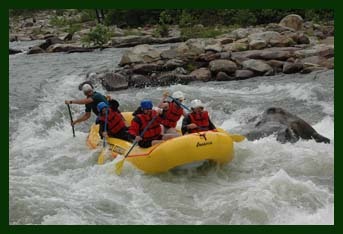 The Ocoee River is often described as the roller coaster of the southeast. Come experience what has been called the greatest whitewater center in the world. We are a professional river outfitter with over 28 years experience. Our safety record is unsurpassed in the industry. We believe our staff is simply the best in the business. Guides are chosen for their character and enthusiasm for sharing the outdoors with you. Cherokee for "land of the noonday sun," the Nantahala River is nestled among the scenic mountains of Western North Carolina. A nationally known river of recreation and sport, the Nantahala River is floated by as many as 160,000 paddlers annually. A Class II-III river, the Nantahala is considered ideal for both the first-timer and experienced rafter. With a wealth of rapids running the length of the river, there's plenty of fun for rafters. 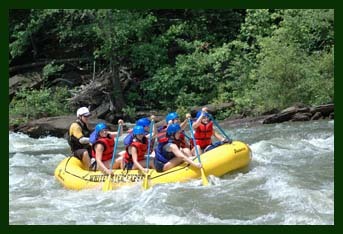 At our Nantahala Outpost your group can experience this unforgettable whitewater adventure through the gorge. Experience the excitement of Patton's Run, the fun and splash of TumbleDry, the rush and roar of riding Class III Nantahala Falls. For a bigger thrill, try taking one of our Duckies down the river!